Sometimes it is wise to leave well enough alone. Like when you are the protagonist in a thriller and you finally escape that inescapable maze, but you decide to go back and find out what made that funny sound. The audience is screaming, “let it go”, but you don’t. 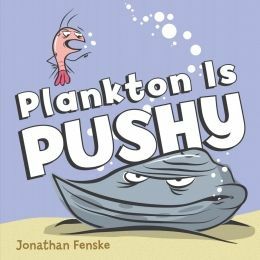 Plankton in Plankton Is Pushy, a picture book written and illustrated by Johnathan Fenske, is in a similar situation. He is a social kind of plankton. He believes in the rules of polite conversation. So when he bumps into Mussel, who refuses to follow said rules, he is a bit perturbed. Plankton explains to Mussel that Mussel is being rude. He tries to model the polite way of answering when someone says hello to you. He tries explaining s-l-o-w-l-y, but Mussel just won’t budge. Personally, I think the look in Mussel’s eye should have warned Plankton to leave well enough alone. Plankton, however, is one of those fearless types who sets a goal and just doesn’t quit until he achieves it, no matter what the cost. The ending is funny, if a bit dark. Younger kids might have questions about Plankton’s fate, but most will probably just laugh and have a good time.